Properties in Saint-Félix-de-Pallières average 4.7 out of 5 stars. Cevennes farmhouse of character with private pool, quality service. Property 6: Cevennes farmhouse of character with private pool, quality service. 3 bedroom accommodation in St-Sebastien d'Aigref. Property 7: 3 bedroom accommodation in St-Sebastien d'Aigref. Green Tourism in Cévennes': quiet, authenticity, sun, nature. 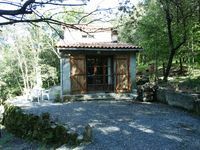 Property 15: Green Tourism in Cévennes': quiet, authenticity, sun, nature. ecological raw mud house built on a sloping hill. Property 22: ecological raw mud house built on a sloping hill. Cottage in the countryside, in the heart of the Cevennes. 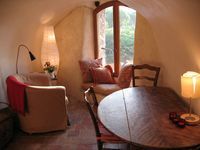 Property 25: Cottage in the countryside, in the heart of the Cevennes. We had a lovely stay at this nice house in de the mountains. The house is modern with even USB Sockets to charge your phone. If I had to name one flaw of the house it would be that the dishwasher takes like for ever to wash the dishes. The layout of the house is very pleasant. It has two rooms one down and one upstairs both with their own shower and toilet. Our kids slept upstairs and had a &ldquo;playroom&rdquo; in front of their room, while our room had a nice seat with television before we enter our room. The outside was great as well, there were multiple places to sit and there was a nice BBQ. There were butterflies everywhere and one evening we heard the wild boars close by. The children had a swing to play and a sandbox as well. The village for groceries is at a 8 minute drive, but walking there is also an option. The only thing that would made this house even better would be a swimming pool, which will be there next year! The owners are really nice and helpful, I had a kidney infection the first week and they arraigned a doctor&rsquo;s appointment and collected the forms I need the fill in before this appointment. Their English is not great, but then again our French was worse. I would totally recommend this house if you want a holiday away from it all. It is a great place for walking, it is in the middle of nature and the house has everything to relax.